I'm sorry I haven't been around! My head has been moving in other directions...moving from one client to another plus a bunch of other work related stuff. So much to say, I'll never say it all! One thing I can say very enthusiastically... I find this to be the best time in a very, very long time, that, really, all the kitchens I am working on are interesting, aesthetically challenging, and all kinds of other good stuff. I'm loving my work. I'm enjoying my clients. I'm really revved about all of what I'm working on! Let's take Grace. As I said, we installed most of the kitchen and Grace decided, after some time, that she just didn't love one section of the kitchen. 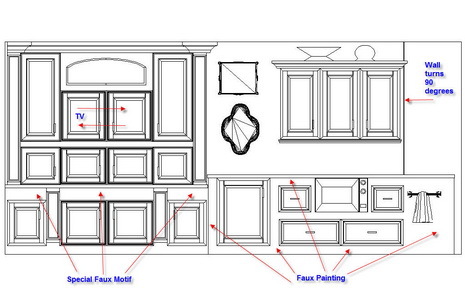 And, she wanted to design an entirely new and different wall (in the upper section, the base cabinets would stay). Luckily, what she decided NOT to use was not a large financial loss. So, I came up with another plan, which Grace loves. The left side of the elevation is opposite the dining area, the right side, opposite the main kitchen area. What's the message here? I think it is, that if you can't live with something, and you're willing to change it....change it. Don't freak out. Go with the flow and see where it takes you. The answer is different for everyone. This will be ordered shortly. Here's something else I'm working on for another client. It's just one small wall of a BIG kitchen, a Kosher kitchen. I think it's cool. And, one more random note, not really about kitchens, that's why it's random! Run over the Surroundings where a contest is about to begin for a very cool lamp. Free is good, contests are fun, and you really should check out Surroundings in any event! The lamp is from the Jonathon Adler collection. Be back real soon, I've missed blogging and think of it every day, it's just been hectic!